Everything you need to teach shape recognition is in this theme. It includes activities for children that are packed with circles, squares, and triangles! Glue five different shapes onto five gift bags (triangle, circle, square, rectangle, diamond). Insert five surprise activities in the gift bags (such as a pyjama day, lunch at the playground, a special snack, etc.). Each day, present your group with a challenge such as cleaning up extra well, following instructions, sharing, etc. During your afternoon circle time, if they succeeded your challenge, select a bag and discover, along with your group, which surprise activity you will enjoy right away or the following day if necessary. We suggests an imaginary game you can enjoy each day. (Open thematic letter - Shapes) Place the envelope in an easy to find location within the daycare. During circle time, ask children to find the letter and read portions of the interactive story to them each day. 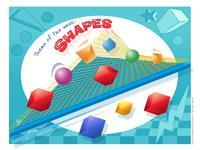 This week, we have prepared a picture game which includes shapes of various sizes. (Open picture game - Shapes) Print and laminate the format you wish to use. The picture game may be used as a memory game, to spark a conversation with the group, or to decorate your daycare or a thematic corner. Decorate the area with road signs. Not only will they add color, they have various shapes. Children can learn to name them while having fun. Use blocks shaped like cylinders, arches, etc. Blocks shaped like wooden logs. A few empty toilet paper or paper towel rolls may be used to create tunnels. Ping-pong balls can be integrated into children's constructions. Pre-cut shapes in different sizes (five circles of various sizes, six triangles, etc.) Use them to make individual crafts or a collective mural. Cardboard shapes children can cut on the dotted lines. This theme is perfect for practicing scissor skills. Various shapes of plastic containers which can be dipped in paint and used to make prints. A circle, a square, four rectangles, and a triangle can be used to make a collage which looks like a funny character. Invite children to manipulate cooked spaghetti noodles to make them look like shapes. Let dry flat until the next day. The result will be fun shapes! Prepare a recipe of salt dough and use cookie cutters representing various shapes. Coloring pages which include the shapes you wish to introduce. Bingo markers make great, inexpensive circle stamps. A chalkboard and chalk...and why not sidewalk chalk for outdoors too! Transform your area to look like a workshop. Make your tools and workbench available. A construction worker's helmet is also perfect! The kitchen area, although more traditional, can also be used to explore shapes...plates, food items, knives...everything we see is made up of shapes. Memory game using educatall picture game or a memory game which contains cards of an untraditional shape. Modeling dough with cookie cutters. A magnetic board and magnets which look like basic shapes. If you do not have a magnetic board, a cookie sheet is perfect. A homemade texture game: a square cut out of sandpaper, a circle made with yarn, a triangle cut out of fake fur, etc. Dot to dot activities which reveal different shapes. 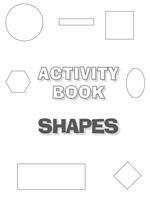 Activity sheets which involve shape recognition. A "Twister" game which involves shapes and colors. An obstacle course complete with obstacles of various shapes. An obstacle course which includes road signs. A walk in the neighborhood: look for shapes. With your help, children will have fun searching for them! Rice bin with cardboard shapes to search for...you can turn this into an association game. Children must sort their findings into identical pairs. Make bubbles with instruments of different shapes. The word flashcards may be used to spark a conversation with the group or in your reading and writing area. Use them to identify your thematic bins. 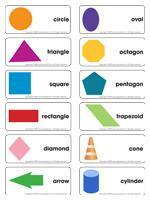 (Open word flashcards - Shapes) circle, triangle, square, rectangle, diamond, arrow, oval, octagon, pentagon, trapezoid, cone, cylinder. Visit a store to pick up a computer or television box. Cut various shapes out of the sides of the box: squares, triangles, circles, rectangles. Make small and large openings at ground level and higher up on the box too. Reinforce the edges of the cutout shapes with colorful adhesive tape. Provide children with balls of different sizes. They will have fun throwing the balls through the various shapes. Be sure to have one opening which is large enough to collect the balls from inside the box. Present a shape to your group. When you give them the signal, they must bring you all the items they can find which look like the same shape. Cut geometric shapes out of Bristol cardboard (one shape per piece). In your daycare or outdoors, deposit the shapes on the ground. The leader of the game gives instructions such as, "Simon says: sit on a diamond." Whenever the leader of the game says "Simon says", children must follow the instructions. Otherwise, they must remain still. Set up gymnastics mats and encourage children to perform somersaults...to roll like balls. Help children discover how shapes can be transformed (for example, two triangles can form a star, a triangle and a square can form a house, two circles can form a snowman, etc.) Next, ask children to find objects which are round, square, etc. They may be actual objects which can be found in the daycare or abstract objects such as the sun. Who do the shapes belong to? (Open picture game - Shapes) Print and laminate. Deposit the series of large shapes in a circle on the floor, making sure to have one shape per child. Hold the series of small shapes in your hands. Begin the game by having children stand behind a shape. To the sound of music, children walk around the shapes. When the music stops, children must quickly sit on a shape. Pick a card from the stack of cards you are holding. The child who is sitting on the shape you picked must go sit in the center of the circle. The game ends when there is only one child left. (Open hunt and seek - Shapes) Print and laminate. Children pick an illustration and search for it in the large picture. (Open lacing - Shapes) Print, laminate, and punch holes around the contours of the shapes. Deposit laces with knotted ends on a table. Invite children to lace the shapes. Show children various shape illustrations and have them name them. Next, children close their eyes. Remove one shape and have children identify the shape which disappeared. (Open bingo - Shapes) Print, laminate, and store the game in a small box or "Ziploc" bag. Play bingo with geometric shapes. Use four pieces of black felt. Glue them on a large piece of cardboard and display on the wall. Have children help you trace and cut various shapes out of colorful felt. The shapes will stick to the black felt. Children will have fun while learning. I suggest using a series of shapes which children can use to build various objects. (Open geometric shapes) The choice of colors is up to you. Visit our online store to purchase felt in a wide variety of colors. Children sit in a circle. Place a variety of blocks with different shapes in the center of the circle. Children take turns selecting a block, naming the shape, and depositing it to make a giant tower. Set up a golf course in your backyard. Use different sizes of containers (buckets, ice cream containers, yogurt containers, bowls, etc.) Organize them as you wish and surround each hole with a rope or a hoola hoop. Give each child his own golf ball. Children try to make the ball go in the container while standing outside the circle. Start with the easiest hole and proceed towards the most difficult one, depending on the size of both the containers and circles. Purchase a set of balloons in different colors and shapes. Fill them with water and leave them in the freezer. Once the water is frozen, remove the balloons and keep only the frozen shapes. Deposit them in a small kiddy pool or large bin. Let children manipulate them. Observe the transformation of the shapes. For older children, drop food coloring onto the shapes using an eyedropper and watch the color changes which occur. Prepare donuts with your group. Make sure children notice that donuts have a round shape. Cut bananas or oranges into slices so they look like circles. Cut melon or apples into wedges so they look like crescents. Crackers can represent squares while cheese slices cut diagonally are perfect for triangles... Follow your imagination. You can explore a single shape per day and adapt your snack accordingly. (Open Game - I am learning how to cut) Print and staple together to make a booklet for each child. Throughout the week, children can trace and cut out the shapes. Provide children with sheets of tissue paper which they can tear and glue on cardboard. The goal is to make a round shape. Provide children with objects of various shapes (half of a potato, a cube, a sponge, a Popsicle stick, etc. Dip the objects in paint and make prints on a piece of cardboard. Let dry then cut out and glue to make an original poster. You will need a roll of paper for this activity. Children lie down on the paper one at a time, spreading out their arms and their legs. Carefully trace the contour of each child's body. When you are done, they can each cut out their body shape. If little ones are still learning to use scissors, help them or leave their figure intact. Provide children with material they can use to decorate their body outline (use whatever you have on hand and a touch of imagination). Children can display their figures on the daycare wall or on their bedroom door. Find one or more large cardboard boxes. Create divisions by adding additional boxes. You can include a bedroom, a kitchen, a bathroom, etc. Add objects to each room (for example, in a bedroom you may add a pillow, a book, a flashlight, etc.) Add one more box children can use to represent a car. Use this activity to learn about space: above-below, to the right-to the left, in front-behind. 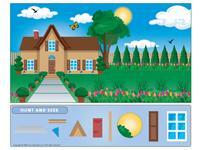 (Open geometric shapes) Let children cut out the shapes. Have them glue them on construction paper or cardboard to create a character. Ask children to trace circles on a sheet of paper. Have them complete their masterpiece by adding a nose, a mouth, two eyes, and even two ears to their circles. Build a sailboat with your group. Use a banana split container and let children paint and decorate it as they wish. Attach a drinking straw to the bottom of the container using hot glue. For the sail, insert the straw in a triangle which children have previously decorated. 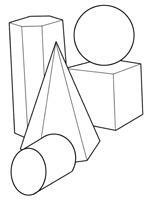 (Open coloring pages theme - Shapes) Print.